The cell is the basic unit of biology and protein expression drives cellular function. Tracking protein expression in single cells enables the study of cellular pathways and behavior, but requires methodologies sensitive enough to detect low numbers of protein molecules with a wide dynamic range to distinguish unique cells and quantify population distributions. This study presents an ultrasensitive and automated approach for quantifying phenotypic responses with single cell resolution using single molecule array (Simoa) technology. We demonstrate how prostate specific antigen (PSA) expression varies over several orders of magnitude between single prostate cancer cells, and how PSA expression shifts with genetic drift. Single cell Simoa intduces a straightforward process that is capable of detecting both high and low protein expression levels. This technique could be useful for understanding fundamental biology and may eventually enable both earlier disease detection and targeted therapy. Quanterix’s proprietary Simoa™ technology (named for single molecule array) is based upon the isolation of individual immunocomplexes on paramagnetic beads using standard ELISA reagents. The main difference between Simoa and conventional immunoassays lies in the ability to trap single molecules in femtoliter-sized wells, allowing for a “digital” readout of each individual bead to determine if it is bound to the target analyte or not. The digital nature of the technique allows an average of 1000x sensitivity increase over conventional assays with CVs <10%. A. Single protein molecules are captured and labeled on beads using standard ELISA reagents. B. Tens of thousands of beads – with or without immunoconjugate – are mixed with enzyme substrate and loaded into individual femtoliter-sized wells. C. The microwells are sealed with oil. D. Fluorophore concentration in the small sample volume of wells containing the target analyte rapidly reach detectable limits using conventional fluorescence imaging and can be digitally counted. E. The percentage of beads containing labelled immunocomplexes can be computed at low concentration because they follow a Poisson distribution; at higher concentrations the intensity of the aggregate signal provides an analog measurement. Assessing the commutability of reference material formats for the harmonization of amyloid beta measurements. Bjerke M, Andreasson U, Kuhlmann J, Portelius E, Pannee J, Lewczuk P, Umek RM, Vanmechelen E, Vanderstichele H, Stoops E,Lewis J, Vandijck M, Kostanjevecki V, Jeromin A, Salamone SJ, Schmidt O, Matzen A, Madin K, Eichenlaub U, Bittner T, Shaw LM,Zegers I, Zetterberg H, Blennow K.
The cerebrospinal fluid (CSF) amyloid-β (Aβ42) peptide is an important biomarker for Alzheimer’s disease (AD). Variability in measured Aβ42 concentrations at different laboratories may be overcome by standardization and establishing traceability to a reference system. Candidate certified reference materials (CRMs) are validated herein for this purpose. Commutability of 16 candidate CRM formats was assessed across five CSF Aβ42 immunoassays and one mass spectrometry (MS) method in a set of 48 individual clinical CSF samples. Promising candidate CRM formats (neat CSF and CSF spiked with Aβ42) were identified and subjected to validation across eight (Elecsys, EUROIMMUN, IBL, INNO-BIA AlzBio3, INNOTEST, MSD, Simoa, and Saladax) immunoassays and the MS method in 32 individual CSF samples. Commutability was evaluated by Passing-Bablok regression and the candidate CRM termed commutable when found within the prediction interval (PI). The relative distance to the regression line was assessed. The neat CSF candidate CRM format was commutable for almost all method comparisons, except for the Simoa/MSD, Simoa/MS and MS/IBL where it was found just outside the 95% PI. However, the neat CSF was found within 5% relative distance to the regression line for MS/IBL, between 5% and 10% for Simoa/MS and between 10% and 15% for Simoa/MSD comparisons. The neat CSF candidate CRM format was commutable for 33 of 36 method comparisons, only one comparison more than expected given the 95% PI acceptance limit. We conclude that the neat CSF candidate CRM can be used for value assignment of the kit calibrators for the different Aβ42 methods. Cerebral β-amyloidosis is induced by inoculation of Aβ seeds into APP transgenic mice, but not into App−/− (APP null) mice. We found that brain extracts from APP null mice that had been inoculated with Aβ seeds up to 6 months previously still induced β-amyloidosis in APP transgenic hosts following secondary transmission. Thus, Aβ seeds can persist in the brain for months, and they regain propagative and pathogenic activity in the presence of host Aβ. Ultra-sensitive bead-based Simoa technology detects residual human Aβ in hippocampal extracts of inoculated App−/− mice. Aβ seed-containing APP23 brain extract or seed-negative WT mouse brain extract was injected into the hippocampus of App−/− mice. The injected hippocampi were isolated 1, 30, 60, or 180 dpi (see Figures 1 and 2). Induced amyloid lesions are partly congophilic and surrounded by activated microglia and dystrophic boutons. • Reviewing 45 years of Glial fibrillary acidic protein (Gfap). •Gfap discovered in multiple sclerosis brain tissue. •From Gfap genetics to post-translational modifications. •Ninety-nine ways to quantify Gfap and related immune phenomena. •Emergence of Gfap as a body fluid biomarker in human disease. This review on the role of glial fibrillary acidic protein (GFAP) as a biomarker for astroglial pathology in neurological diseases provides background to protein synthesis, assembly, function and degeneration. Qualitative and quantitative analytical techniques for the investigation of human tissue and biological fluid samples are discussed including partial lack of parallelism and multiplexing capabilities. Pathological implications are reviewed in view of immunocytochemical, cell-culture and genetic findings. Particular emphasis is given to neurodegeneration related to autoimmune astrocytopathies and to genetic gain of function mutations. The current literature on body fluid levels of GFAP in human disease is summarised and illustrated by disease specific meta-analyses. In addition to the role of GFAP as a diagnostic biomarker for chronic disease, there are important data on the prognostic value for acute conditions. The published evidence permits to classify the dominant GFAP signatures in biological fluids. This classification may serve as a template for supporting diagnostic criteria of autoimmune astrocytopathies, monitoring disease progression in toxic gain of function mutations, clinical treatment trials (secondary outcome and toxicity biomarker) and provide prognostic information in neurocritical care if used within well defined time-frames. with lower levels in patients who survived. A trend analysis showed that both CSF and plasma Ab42 levels strongly correlated with mortality. A positive correlation between changes in CSF Ab42 concentrations and neurological status as assessed by Glasgow Coma Scale (GCS) was identified. Our results suggest that determination of Ab42 may be valuable to obtain prognostic information in patients with severe TBI as well as in monitoring the response of the brain to injury. Efforts to find reliable blood biomarkers for Alzheimer’s disease (AD) in a highly warranted clinical laboratory test have met with little success. There is no clear change in plasma ß-amyloid in AD, and assays for the axonal injury marker tau have been hampered by a lack of analytical sensitivity for accurate measurement in blood samples. Here, the results of a novel ultra-sensitive assay for tau in peripheral blood are reported. Publication: Alzheimer’s Research & Therapy 2013, 5:9. Efforts to find reliable blood biomarkers for Alzheimer’s disease (AD) in a highly warranted clinical laboratory test have met with little success. There is no clear change in plasma β-amyloid in AD, and assays for the axonal injury marker tau have been hampered by a lack of analytical sensitivity for accurate measurement in blood samples . Here, the results of a novel ultra-sensitive assay for tau in peripheral blood are reported. Here, we assess the association of plasma tau levels with AD in a cross-sectional study of 54 patients with AD dementia , 75 patients with mild cognitive impairment (MCI) , and 25 cognitively normal controls (Table 1). All participants were recruited at the specialized memory clinic at Skåne University Hospital in Malmö, Sweden, and underwent extensive clinical evaluation, including cerebrospinal fluid (CSF) sampling by lumbar puncture, in addition to venipuncture and collection of blood in ethylenediaminetetraacetic acid (EDTA) tubes for plasma preparation by centrifugation within 15 minutes from sampling. Plasma samples were aliquoted into cryo tubes and stored at -80°C pending analysis, which was performed on one occasion by using one batch of reagents with an average coefficient of variation of 9.7% for triplicate measurements of each sample. The patients with MCI were cognitively stable for an average of 101 months (n = 36) or developed AD dementia (n = 35) or other types of dementias – vascular dementia (n = 3) and semantic dementia (n = 1) – during follow-up. The study was approved by the regional ethics committee at Lund University and complied with the Declaration of Helsinki. Informed consent was obtained from all study participants. Elevated tau levels in plasma from patients with Alzheimer’s disease (AD). (a) Plasma levels of tau are elevated in patients with AD compared with cognitively normal controls and patients with mild cognitive impairment (MCI). (b) MCI patients who developed AD (MCI-AD) during follow-up had baseline tau levels similar to those of patients with stable MCI (SMCI). (c) There was no correlation between tau levels in plasma and cerebrospinal fluid (CSF) in any diagnostic group. Thin horizontal lines in panels (a) and (b) indicate medians. A nonparametric Kruskal-Wallis test followed by Mann-Whitney was performed to test for statistical significance. Spearman’s rank correlation coefficient was used to assess the relationship between plasma and CSF tau concentrations in panel (c), where open circles, gray squares, and black triangles represent AD, MCI, and controls, respectively. A research team led by researchers from the University of California has modified the CRISPR/Cas9 system to demonstrate the ability to track specific RNA sequences and processes in vivo. As described in a paper published today in Cell, the investigators were able to use their system to visualize specific RNA molecules accumulating in stress granules — dense aggregations of proteins and RNA that form in the cytosol in response to cellular stress and have been linked to neurodegenerative disorders such as amyotrophic lateral sclerosis. They also found that they could use Cas9 to target an mRNA without altering mRNA abundance or the amount of translated protein. “We are just beginning to see the implications of genome engineering using the CRISPR technology, but many diseases, including cancer and autism, are linked to problems with another fundamental biological molecule: RNA,” Gene Yeo, senior study author and an associate professor at the University of California, San Diego, said in a statement. The researchers began their project based on a modification attempted in the lab of co-author Jennifer Doudna from the University of California, Berkeley. Inthat study, the researchers found that it was possible to design a protospacer adjacent motif (PAM) as part of an oligonucleotide (PAMmer) which binds to the single-stranded RNA, allowing Cas9 to efficiently recognize and cleave RNA rather than DNA (RCas9). The researchers determined that with a few further modifications, they could use this method to not only recognize RNA instead of DNA but actually track its movements through cells. Previously, researchers have attempted to use molecular beacons to track RNA sequences, however, these are limited to imaging applications and are difficult to deliver into cells. Researchers have also attempted to use aptamers to enable RNA tracking in living cells, but these are limited in the number of RNA sequences that they can recognize. CRISPR/Cas9, however, has thus far proved extremely useful in the genome engineering field and the research team thought that it would be an ideal base to create a better RNA tracking tool. 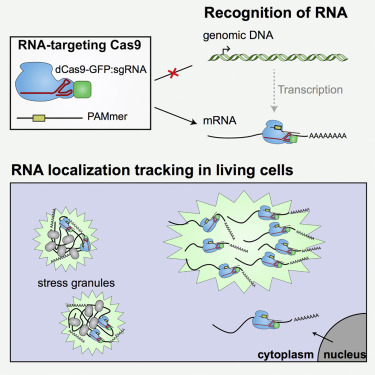 To prove their concept, the team tested whether a dead Cas9 (dCas9) that was tagged with the fluorescent protein mCherry and contained a nuclear localization signal could be co-exported from the nucleus with a messenger RNA in the presence of a single-guide RNA (sgRNA) and PAMmer designed to recognize that specific mRNA. 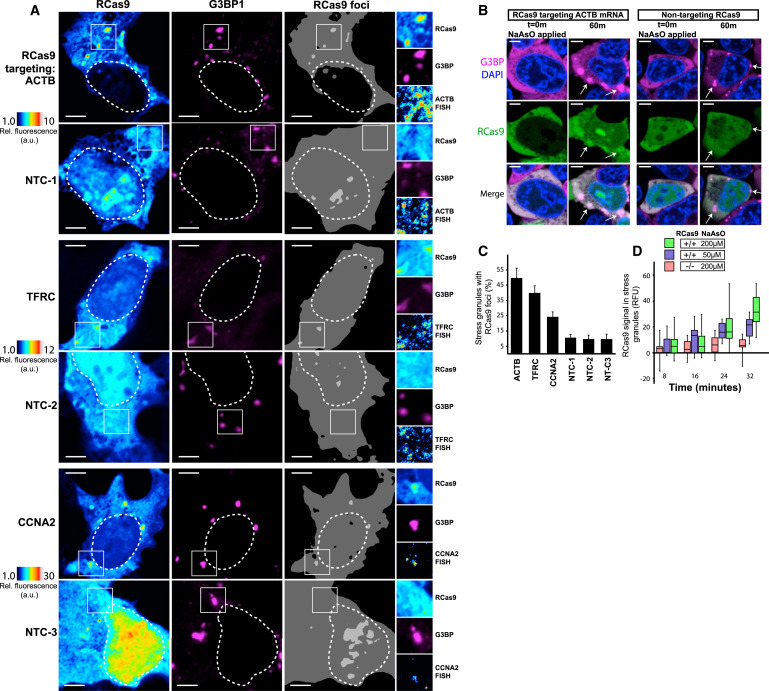 The experiment succeeded and the researchers were also able to observe accumulation of ACTB, CCNA2, and TFRC mRNAs in RNA granules that correlated with fluorescence in situ hybridization visualization using image analysis software. Once they had established that their method was effective, the researchers showed that they could use the sgRNA and PAMmer targeting sequences to track mRNA trafficking to stress granules. The researchers demonstrated that they could take time-resolved measurements of ACTB mRNA trafficking to stress granules over a period of 30 minutes. They noted in the paper that RCas9 was capable of measuring the association of CCNA2 and TFRC mRNA trafficking to stress granules, as well. Based on their results, the investigators believe they have established RCas9 as a means to track RNA in living cells in a programmable manner that doesn’t require genetically encoded tags. Clustered regularly-interspaced short palindromic repeats (CRISPRs) form the basis of adaptive immune systems in bacteria and archaea by encoding CRISPR RNAs that guide CRISPR-associated (Cas) nucleases to invading genetic material (Wiedenheft et al., 2012). Cas9 from the type II CRISPR system ofS. pyogenes has been repurposed for genome engineering in eukaryotic organisms (Hwang et al., 2013, Li et al., 2013a, Mali et al., 2013, Nakayama et al., 2013, Sander and Joung, 2014, Yang et al., 2014) and is rapidly proving to be an efficient means of DNA targeting for other applications such as gene expression modulation (Qi et al., 2013) and imaging (Chen et al., 2013). Cas9 and its associated single-guide RNA (sgRNA) require two critical features to target DNA: a short DNA sequence of the form 5′-NGG-3′ (where “N” = any nucleotide) known as the protospacer adjacent motif (PAM) and an adjacent sequence on the opposite DNA strand that is antisense to the sgRNA. By supporting DNA recognition with specificity determined entirely by a short spacer sequence within the sgRNA, CRISPR/Cas9 provides uniquely flexible and accessible manipulation of the genome. Manipulating cellular RNA content, in contrast, remains problematic. Whereas there exist robust means of attenuating gene expression via RNAi and antisense oligonucleotides, other critical aspects of post-transcriptional gene expression regulation such as subcellular trafficking, alternative splicing or polyadenylation, and spatiotemporally restricted translation are difficult to measure in living cells and are largely intractable. Analogous to the assembly of zinc finger nucleases (Urnov et al., 2010) and transcription activator-like effector nucleases (TALEN) to recognize specific DNA sequences, efforts to recognize specific RNA sequences have focused on engineered RNA-binding domains. Pumilio and FBF homology (PUF) proteins carry well-defined modules capable of recognizing a single base each and have supported successful targeting of a handful of transcripts for imaging and other manipulations (Filipovska et al., 2011, Ozawa et al., 2007, Wang et al., 2009). PUF proteins can be fused to arbitrary effector domains to alter or tag target RNAs, but PUFs must be redesigned and validated for each RNA target and can only recognize eight contiguous bases, which does not allow unique discrimination in the transcriptome. Molecular beacons are self-quenched synthetic oligonucleotides that fluoresce upon binding to target RNAs and allow RNA detection without construction of a target-specific protein (Sokol et al., 1998). But molecular beacons must be microinjected to avoid the generation of excessive background signal associated with endosome-trapped probes and are limited to imaging applications. An alternative approach to recognition of RNA substrates is to introduce RNA aptamers into target RNAs, enabling specific and strong association of cognate aptamer-binding proteins such as the MS2 coat protein (Fouts et al., 1997). This approach has enabled tracking of RNA localization in living cells over time with high sensitivity (Bertrand et al., 1998) but relies upon laborious genetic manipulation of the target RNA and is not suitable for recognition of arbitrary RNA sequences. Furthermore, insertion of exogenous aptamer sequence has the potential to interfere with endogenous RNA functions. Analogous to CRISPR/Cas9-based recognition of DNA, programmable RNA recognition based on nucleic acid specificity alone without the need for genetic manipulation or libraries of RNA-binding proteins would greatly expand researchers’ ability to modify the mammalian transcriptome and enable transcriptome engineering. Although the CRISPR/Cas9 system has evolved to recognize double-stranded DNA, recent in vitro work has demonstrated that programmable targeting of RNAs with Cas9 is possible by providing the PAM as part of an oligonucleotide (PAMmer) that hybridizes to the target RNA (O’Connell et al., 2014). By taking advantage of the Cas9 target search mechanism that relies on PAM sequences (Sternberg et al., 2014), a mismatched PAM sequence in the PAMmer/RNA hybrid allows exclusive targeting of RNA and not the encoding DNA. The high affinity and specificity of RNA recognition by Cas9 in cell-free extracts and the success of genome targeting with Cas9 indicate the potential of CRISPR/Cas9 to support programmable RNA targeting in living cells. To assess the potential of Cas9 as a programmable RNA-binding protein in live cells, we used a modified sgRNA scaffold with improved expression and Cas9 association (Chen et al., 2013) with a stabilized PAMmer oligonucleotide that does not form a substrate for RNase H. We measured the degree of nuclear export of a nuclear localization signal-tagged nuclease-deficient Cas9-GFP fusion and demonstrate that the sgRNA alone is sufficient to promote nuclear export of Cas9 without influencing the abundance of the targeted mRNA or encoded protein. In order to evaluate whether RNA-targeting Cas9 (RCas9) signal patterns correspond with an established untagged RNA-labeling method, we compared distributions of RCas9 and fluorescence in situ hybridization (FISH) targeting ACTB mRNA. We observed high correlation among FISH and RCas9 signal that was dependent on the presence of a PAMmer, indicating the importance of the PAM for efficient RNA targeting. RNA trafficking and subcellular localization are critical to gene expression regulation and reaction to stimuli such as cellular stress. To address whether RCas9 allows tracking of RNA to oxidative stress-induced RNA/protein accumulations called stress granules, we measured ACTB, TFRC, and CCNA2 mRNA association with stress granules in cells subjected to sodium arsenite. Finally, we demonstrated the ability of RCas9 to track trafficking of ACTB mRNA to stress granules over time in living cells. This work establishes the ability of RCas9 to bind RNA in live cells and sets the foundation for manipulation of the transcriptome in addition to the genome by CRISPR/Cas9. (A) Components required for RNA-targeting Cas9 (RCas9) recognition of mRNA include a nuclear localization signal-tagged nuclease-inactive Cas9 fused to a fluorescent protein such as GFP, a modified sgRNA with expression driven by the U6 polymerase III promoter, and a PAMmer composed of DNA and 2′-O-methyl RNA bases with a phosphodiester backbone. The sgRNA and PAMmer are antisense to adjacent regions of the target mRNA whose encoding DNA does not carry a PAM sequence. After formation of the RCas9/mRNA complex in the nucleus, the complex is exported to the cytoplasm. 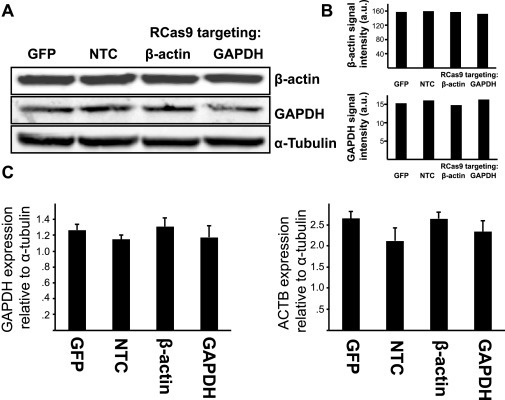 (B) RCas9 nuclear co-export with GAPDH mRNA. The RCas9 system was delivered to U2OS cells with a sgRNA and PAMmer targeting the 3′ UTR of GAPDH or sgRNA and PAMmer targeting a sequence from λ bacteriophage that should not be present in human cells (“N/A”). Cellular nuclei are outlined with a dashed white line. Scale bars represent 5 microns. (C) Fraction of cells with cytoplasmic RCas9 signal. Mean values ± SD (n = 50). (D) A plasmid carrying the Renilla luciferase open reading frame with a β-globin 3′ UTR containing a target site for RCas9 and MS2 aptamer. A PEST protein degradation signal was appended to luciferase to reveal any translational effects of RCas9 binding to the mRNA. (E) RNA immunoprecipitation of EGFP after transient transfection of the RCas9 system in HEK293T cells targeting the luciferase mRNA compared to non-targeting sgRNA and PAMmer or EGFP alone. Mean values ± SD (n = 3). (F and G) Renilla luciferase mRNA (F) and protein (G) abundances were compared among the targeting and non-targeting conditions. Mean values ± SD (n = 4). p values are calculated by Student’s t test, and one, two, and three asterisks represent p values less than 0.05, 0.01, and 0.001, respectively. See also Figure S1. RNA-programmed genome editing using CRISPR/Cas9 from Streptococcus pyogenes has enabled rapid and accessible alteration of specific genomic loci in many organisms. A flexible means to target RNA would allow alteration and imaging of endogenous RNA transcripts analogous to CRISPR/Cas-based genomic tools, but most RNA targeting methods rely on incorporation of exogenous tags. Here, we demonstrate that nuclease-inactive S. pyogenesCRISPR/Cas9 can bind RNA in a nucleic-acid-programmed manner and allow endogenous RNA tracking in living cells. We show that nuclear-localized RNA-targeting Cas9 (RCas9) is exported to the cytoplasm only in the presence of sgRNAs targeting mRNA and observe accumulation ofACTB, CCNA2, and TFRC mRNAs in RNA granules that correlate with fluorescence in situ hybridization. We also demonstrate time-resolved measurements of ACTB mRNA trafficking to stress granules. Our results establish RCas9 as a means to track RNA in living cells in a programmable manner without genetically encoded tags. 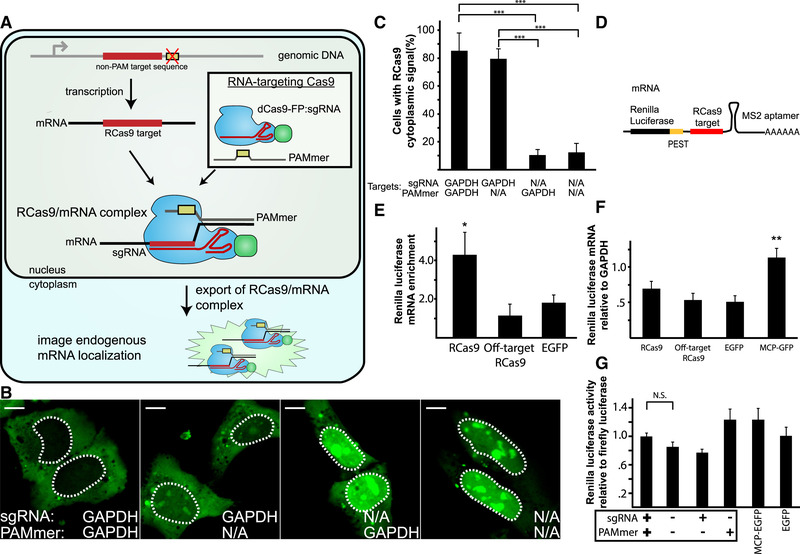 Effective RNA recognition by Cas9 in living cells while avoiding perturbation of the target transcript relies on careful design of the PAMmer and delivery of Cas9 and its cognate guide RNA to the appropriate cellular compartments. Binding of Cas9 to nucleic acids requires two critical features: a PAM DNA sequence and an adjacent spacer sequence antisense to the Cas9-associated sgRNA. By separating the PAM and sgRNA target among two molecules (the PAMmer oligonucleotide and the target mRNA) that only associate in the presence of a target mRNA, RCas9 allows recognition of RNA while avoiding the encoding DNA. To avoid unwanted degradation of the target RNA, the PAMmer is composed of a mixed 2′OMe RNA and DNA that does not form a substrate for RNase H. Further, the sgRNA features a modified scaffold that removes partial transcription termination sequences and a modified structure that promotes association with Cas9 (Chen et al., 2013). Other CRISPR/Cas systems have demonstrated RNA binding in bacteria (Hale et al., 2009, Sampson et al., 2013) or eukaryotes (Price et al., 2015), although these systems cannot discriminate RNA from DNA targets, feature RNA-targeting rules that remain unclear, or rely on large protein complexes that may be difficult to reconstitute in mammalian cells. In this work, we demonstrate RCas9-based recognition of GAPDH, ACTB,CCNA2, and TFRC mRNAs in live cells. Because the U6-driven sgRNA is largely restricted to the nucleus, the NLS-tagged dCas9 allows association with its sgRNA and subsequent interaction with the target mRNA before nuclear co-export with the target mRNA. As an initial experiment, we evaluated the potential of RNA recognition with Cas9 by targeting GAPDH mRNA and evaluating degree of nuclear export of dCas9-mCherry (Figure 1B). Robust cytoplasmic localization of dCas9-mCherry in the presence of a sgRNA-targeting GAPDH mRNA compared to nuclear retention in the presence of a non-targeting sgRNA indicated that Cas9 association with the mRNA was sufficiently stable to support co-export from the nucleus. RCas9 as an RNA-imaging reagent requires that RNA recognition by RCas9 does not interfere with normal RNA metabolism. Here, we show that RCas9 binding within the 3′ UTR of Renilla luciferase does not affect its mRNA abundance and translation (Figures 1F and 1G). The utility of RCas9 for imaging and other applications hinges on the recognition of endogenous transcripts, so we evaluated the influence of RCas9 targeting on GAPDH and ACTB mRNAs and observed no significant differences among the mRNA and protein abundances by western blot analysis and qRT-PCR (Figure S1). These results indicate that RCas9 targeting these 3′ UTRs does not perturb the levels of mRNA or encoded protein. We also evaluated the ability of RCas9 to reveal RNA localization by comparing RCas9 signal patterns to FISH. We utilized a FISH probe set composed of tens of singly labeled probes targeting ACTB mRNA and compared FISH signal distributions to a single dCas9-GFP/sgRNA/PAMmer that recognizes the ACTBmRNA. Our findings indicate that the sgRNA primarily determines the degree of overlap among the FISH and RCas9 signals whereas the PAMmer plays a significant but secondary role. Importantly, in contrast to other untagged RNA localization determination methods such as FISH and molecular beacons, RCas9 is compatible with tracking untagged RNA localization in living cells and can be delivered rapidly to cells using established transfection methods. 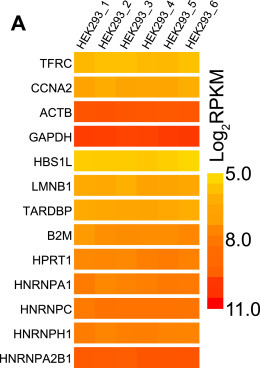 We also note that the distribution of ACTB mRNA was visualized using a single EGFP tag per transcript, and higher-sensitivity RNA tracking or single endogenous RNA molecule visualization may be possible in the future with RCas9 targeting multiple sites in a transcript or with a multiply tagged dCas9 protein. Stress granules are translationally silent mRNA and protein accumulations that form in response to cellular stress and are increasingly thought to be involved with neurodegeneration (Li et al., 2013b). There are limited means that can track the movement of endogenous RNA to these structures in live cells (Bertrand et al., 1998). In addition to ACTB mRNA, we demonstrate that RCas9 is capable of measuring association of CCNA2 and TFRC mRNA trafficking to stress granules (Figure 3A). Upon stress induction with sodium arsenite, we observed that 50%, 39%, and 23% of stress granules featured overlapping RCas9 foci when targeting ACTB, TFRC, and CCNA2 mRNAs, respectively (Figure 3C). This result correlates with the expression levels of these transcripts (Figure S3) asACTB is expressed about 8 and 11 times more highly than CCNA2 and TFRC, respectively. We also observed that RCas9 is capable of tracking RNA localization over time as ACTB mRNA is trafficked to stress granules over a period of 30 min (Figure 3B). We noted a dependence of RCas9 signal accumulation in stress granules on stressor concentration (Figure 3D). This approach for live-cell RNA tracking stands in contrast to molecular beacons and aptamer-based RNA-tracking methods, which suffer from delivery issues and/or require alteration of the target RNA sequence via incorporation of RNA tags. Future applications of RCas9 could allow the measurement or alteration of RNA splicing via recruitment of split fluorescent proteins or splicing factors adjacent to alternatively spliced exons. Further, the nucleic-acid-programmable nature of RCas9 lends itself to multiplexed targeting (Cong et al., 2013) and the use of Cas9 proteins that bind orthogonal sgRNAs (Esvelt et al., 2013) could support distinct activities on multiple target RNAs simultaneously. It is possible that the simple RNA targeting afforded by RCas9 could support the development of sensors that recognize specific healthy or disease-related gene expression patterns and reprogram cell behavior via alteration of gene expression or concatenation of enzymes on a target RNA (Delebecque et al., 2011, Sachdeva et al., 2014). Efforts toward Cas9 delivery in vivo are underway (Dow et al., 2015,Swiech et al., 2015, Zuris et al., 2015), and these efforts combined with existing oligonucleotide chemistries (Bennett and Swayze, 2010) could support in vivo delivery of the RCas9 system for targeted modulation of many features of RNA processing in living organisms. RNA is subject to processing steps that include alternative splicing, nuclear export, subcellular transport, and base or backbone modifications that work in concert to regulate gene expression. The development of a programmable means of RNA recognition in order to measure and manipulate these processes has been sought after in biotechnology for decades. This work is, to our knowledge, the first demonstration of nucleic-acid-programmed RNA recognition in living cells with CRISPR/Cas9. By relying upon a sgRNA and PAMmer to determine target specificity, RCas9 supports versatile and unambiguous RNA recognition analogous to DNA recognition afforded by CRISPR/Cas9. The diverse applications supported by DNA-targeted CRISPR/Cas9 range from directed cleavage, imaging, transcription modulation, and targeted methylation, indicating the utility of both the native nucleolytic activity of Cas9 as well as the range of activities supported by Cas9-fused effectors. In addition to providing a flexible means to track this RNA in live cells, future developments of RCas9 could include effectors that modulate a variety of RNA-processing steps with applications in synthetic biology and disease modeling or treatment. Larry, Nice report.However, gene expression seems to be better than protein expression. Gene expresses itself by the production of proteins. Is the antibody on a pizoelectric detection system as done for PSA before or microcapillary system like BioRad’s protein detection system or are they actually combining MS with this as well?